When I was a kid I was involved in lots of activities – Girl Scouts, piano lessons, learning to play trumpet in band, and baton twirling. Most of it didn’t involve a lot of physical effort, except the baton twirling. Yes, I said baton twirling! Most people think of that as a “nerdy” kind of activity that only a handful of southern beauty queens do for their talent portion in pageants. Let me enlighten you just a little. When I started taking baton lessons at the age of 5, I was shy and quite afraid of being around people – kids included. My parents searched for something that they thought I might enjoy that would also bring me out of my comfy, quiet shell. They offered dance lessons, I rejected them. They thought of different sports and I refused again. 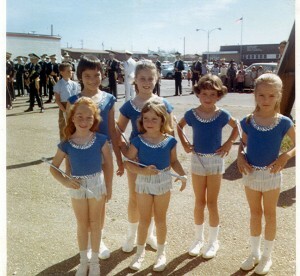 Then they discovered baton twirling, and somehow it appealed to my unique 5-year-old spirit. My first few months of lessons were with a small group of other little girls all trying to master the “two-hand twirl” and the “figure 8.” Of course both those tricks and all the other fancy moves we learned had to be mastered not only by one hand, but by the other hand too. Soon we were also asked to add leg moves such as kicks, jumps, lunges, and turns all while keeping both hands going! Thus, my body had to learn all about coordination and balance, not to mention the cardiovascular training it was receiving by using all those big muscle groups. To put this into the perspective of learning a new skill, imagine trying to learn to write with your non-dominant hand today. How long do you think it would take to master perfect, legible handwriting? Within the first year of taking lessons I was marching down main streets in parades all over the Denver area (I was born there, you see). Our little group had to toss, lift, scoop, pass, kick, leap and twirl all while lifting each knee alternately making sure to “point those toes” every time. Not only that, we had to all do it at precisely the same time, exactly to the beat of the music. Whew! What a workout! We also showed off our talents performing in recitals for which we practiced so hard. I remember my teacher telling us we needed to practice an hour a day. A whole hour – that’s eons to 5 and 6-year-olds. Can you imagine doing something physically demanding that is repetitive for an hour every day? Now that’s what I call EXERCISE! As my coordination, strength, stamina and flexibility increased I was encouraged by my teacher and my parents to take my skills into the competitive arena. For a shy, introverted little person, this would be a major accomplishment. I entered my first solo competition at the age of 7. While I didn’t place first, I DID earn a smaller trophy and a whole lot of SELF CONFIDENCE. From there I began competing in more and more local, regional and state competitions. 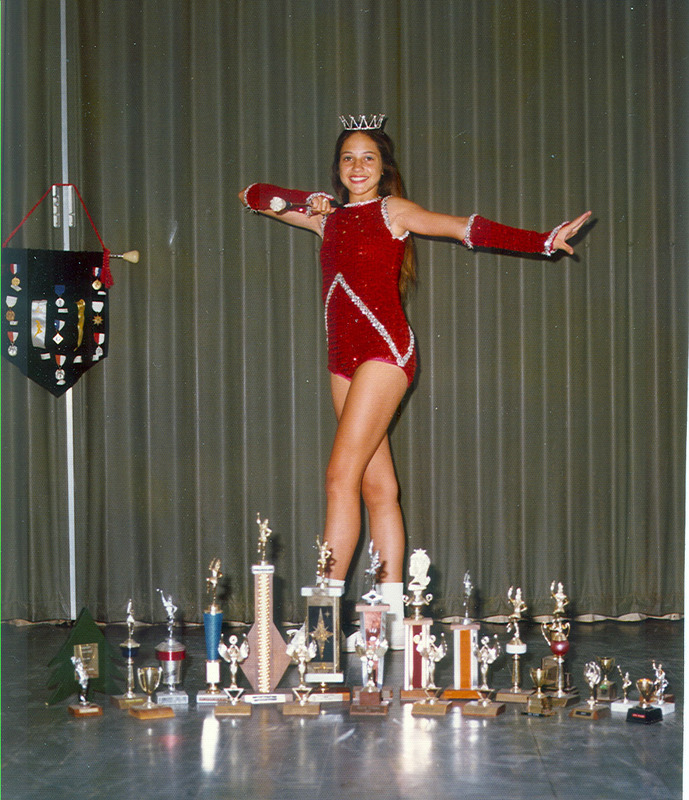 Over my “career” of competitive baton twirling, I earned over 100 trophies and medals. But the most important rewards I earned were the ability to overcome my extreme shyness and, even better, gain the benefits of keeping my body “on its toes” by constantly moving and challenging the muscles, ligaments, joints, bones, heart and lungs – just like a regular, lifelong EXERCISE REGIMEN. As I grew into my teens, I started playing softball. I believe that because I was now able to enjoy being around other kids and doing things on a social level, I searched for more activities that would allow that. What I didn’t know then, that I have been able to see now, is that at that time of my life I adopted an interesting perspective where exercise was concerned. If someone suggested going for a jog or taking a step aerobics class (those were barely invented way back then! ), I skirted the opportunity. My attitude was that I “hated” exercise. I didn’t want any part of organized activity that was categorized as “good for you”. And yet, get me on the softball field and I’d do my level best to hit the ball as far as I could, throw out the runner with all my might, run the bases as fast as my legs would carry me…all in the name of FUN! I know what it’s like to do something that in the back of my mind is “good for you” but is, at the forefront, fun, interesting, and easy. My baton twirling days were not over yet. My family and I moved from Denver to Charleston, South Carolina. 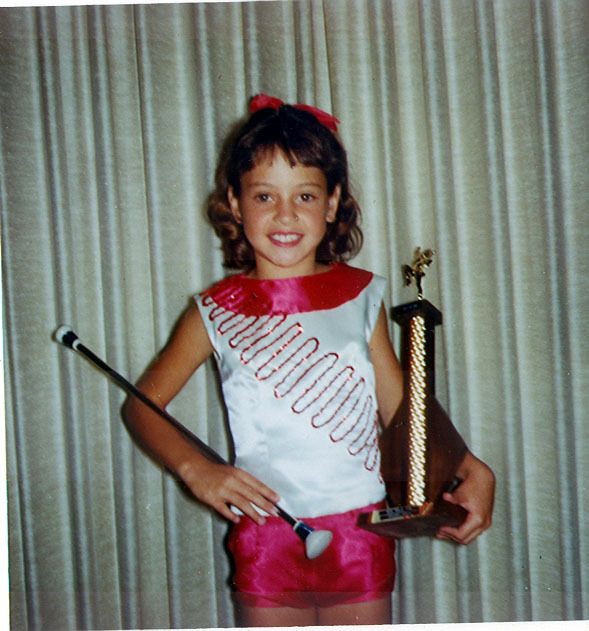 There I became a “feature twirler” for the local high school (I was only in the 8th grade). This meant that I performed as a soloist in front of hundreds of people at the football halftime shows. I’d say THAT was a true test for overcoming stage fright! 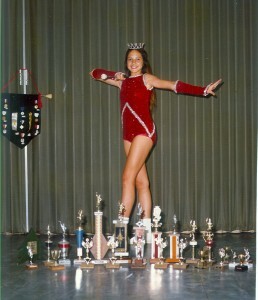 We stayed in South Carolina for a year and a half where I continued my competition twirling. From there, we moved to Topeka, Kansas (my mother’s hometown). Unfortunately, we were not able to find qualified baton teachers, however I was able to continue my twirling ambition by being on the twirling team at my high school, then becoming the drum major and feature twirler there. Upon entering college, I auditioned for and was accepted as a member of the “K-Steppers” twirling team at Kansas State University. This afforded me the opportunity to not only perform for thousands at a time, but I also was fortunate to be a camp counselor/instructor for young girls who wanted to learn the art of baton twirling! I was now giving back the very gift I was given by teaching shy, uncoordinated, eager girls the fantastic craft of baton twirling with all its wonderful “side effects”. 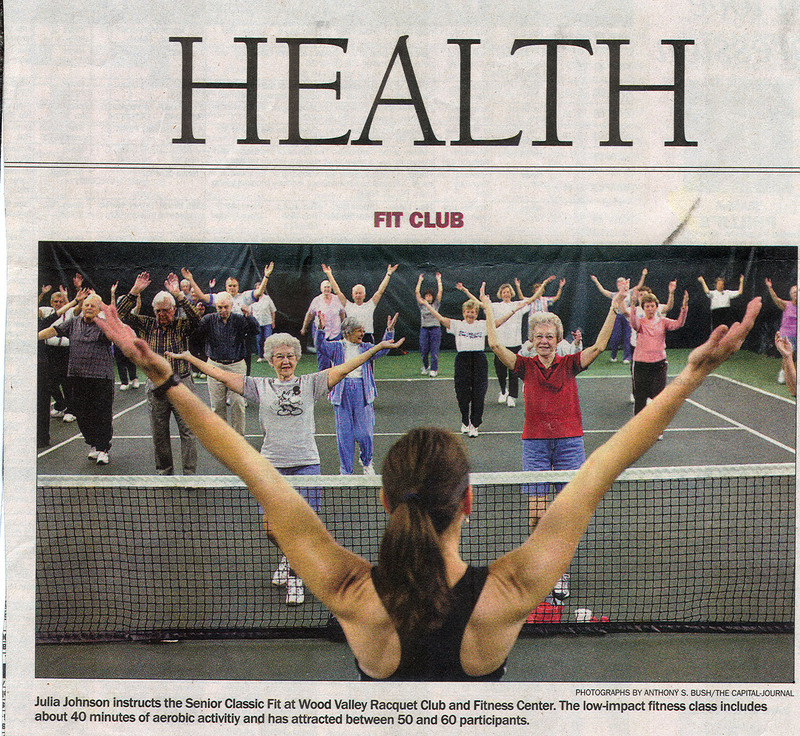 I didn’t know it then, but I think this is where my passion for teaching people about healthy activities was born. After college, I got married and started working in the “real world”. My love for being active did not fade. 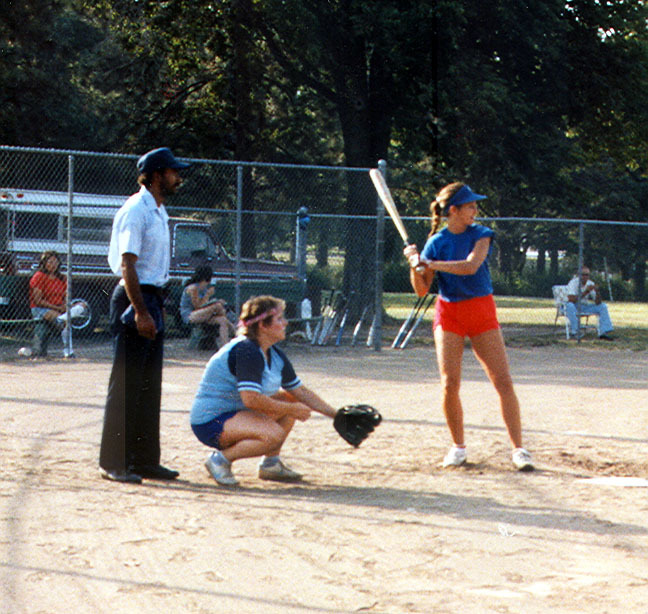 I continued to play softball 4-5 times during the week and on many weekends. When I was 20-something and thinking about starting a family I decided it would be a good time to start “exercising” and eating right so I could give my child(ren) a healthy start. Even though I participated in co-ed and women’s softball leagues, I didn’t really focus on being “in shape”. I also didn’t give much thought to what I was eating each day. At this point I decided to attend a local step aerobics class at my church. 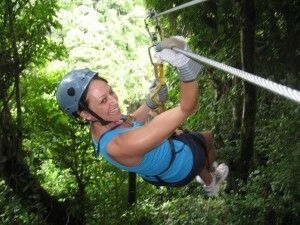 At first I felt a bit clumsy but I didn’t mind it as much as I thought I would. Especially since I was attending along with a close friend of mine. It’s funny how confidence is boosted in numbers. One day, after class, the instructor pulled me aside and said, “I have to be gone next week,would you like to step in and teach for me?” I was dumb-founded and flattered. I told her I didn’t have the faintest idea of what to do, but she assured me that with a few little pointers I would be fine. 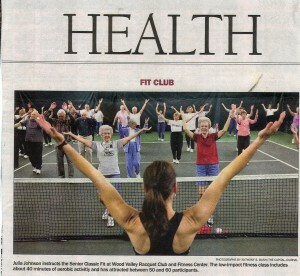 I jumped in the following week and led my first group exercise class. The rest, as they say, is history. I was hooked! It was such an uplifting milestone to know that I could positively affect people by sharing my enthusiasm for motion, activity, music, and feeling of accomplishment. From that exhilarating, empowering experience almost 30 years ago, and two healthy, athletic children later – Zachary and Ariel – (I am a proud mom, too! ), I grew into a passionate, caring, fun-loving, motivating instructor and personal trainer. I earned national certifications from the American Council on Exercise (ACE), the Aerobics & Fitness Association of America (AFAA) and the National Exercise Trainers Association (NETA) and have kept them current through countless hours of continuing education courses. I moved to Arizona in January of 2010 to follow my daughter to Arizona State University, and to live near my father and step-mother who lived in Sun Lakes. 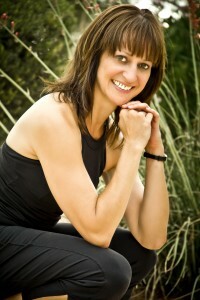 and more, all while maintaining my group exercise teaching and, of course, working one-on-one with my clients. 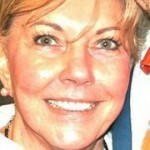 As I add time to my calendar age I realize how important remaining active is to my living with a high quality of life. I don’t plan on slowing down, so I will keep on taking care of my body in order for it to stay strong to the end. Even though I didn’t start out like lots of kids by playing soccer or basketball or other popular sports, I grew up being very active and became a powerful, confident athlete. From this hardy start, I developed a love for movement, well-being and competition. I know this has catapulted me into the field of fitness education because I want to be able to instill in people the same feeling of strength, ease of motion, coordination, balance and flexibility that I have grown to appreciate. I LOVE to see the light-bulb reaction when a client discovers the capabilities that unfold as they progress into a better state of health each day. I also love finding new and interesting ways to lead a client to a life of activity and healthy choices for a better quality of life. I think the best news is, no matter what age someone is, it is always possible to improve, regain and grow into strength, better range of motion and endurance. This is why I continue to teach in any way possible so that I can reach people of all fitness levels, ages and circumstances. It is amazing what the human body can and WILL do to keep its LIFE IN MOTION.